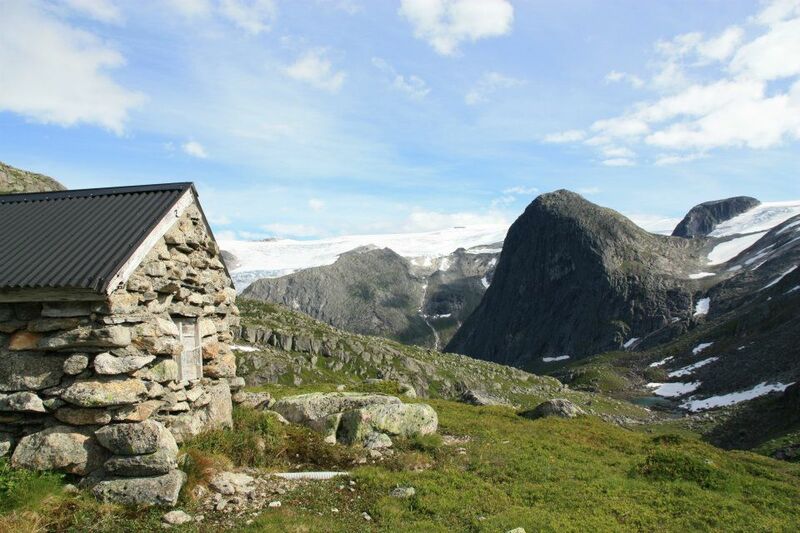 Melkevoll Bretun is the starting point for many great short and long mountain and glacier trips. Climbing, bike hire or a boat trip on the green glacier lake are some of the experiences the surrounding area has to offer. Here you will find descriptions of some of the things you can experience around here. 50 minutes walk (one way) from Melkevoll Bretun. Briksdalsbreen is one of the most visited nature attractions in western Norway. You walk on a nice road all the way, from you pass the restaurant in Briksdal. There is also a possibility for transport with open cars up to the glacier. The trip goes through a beautiful landscape where the sight of waterfalls and glaciers may take your breath away. The road is easy to walk because farmers in Oldedalen created roads and bridges for easy access here, more than 120 years ago. 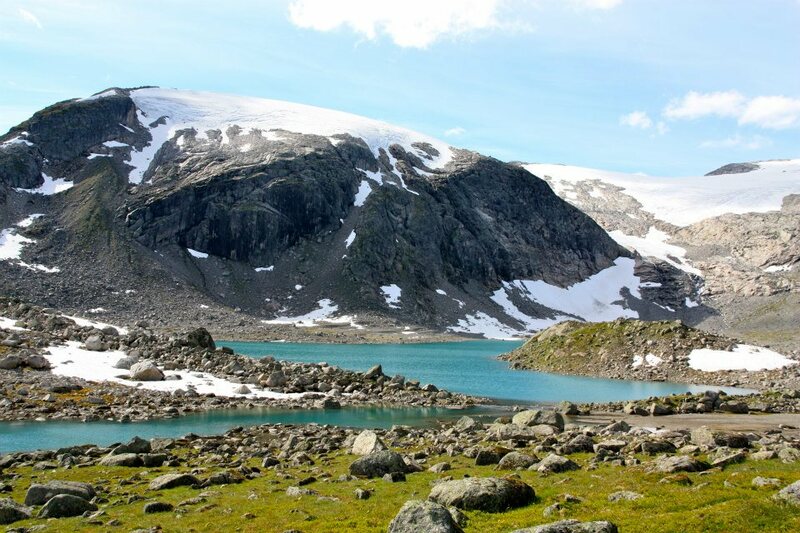 Finally, you cross the border to Jostedalsbreen National Park, and get to Briksdal’s glacier lake, where you can see the glacier stretching up towards the plateau 1500 m.a.s.l. For information about Trollbil visit Oldedalen skyss here. 1.5 km back down the main road from Melkevoll Bretun you find Aabrekk farm on the right hand side. Here you can find a small parking area and the starting point for the trip to «Brenndalen» and Brenndal glacier. The first part of the hike leads through a forest. The path first starts uphill, then it flattens. Brenndalen is a so-called hanging side valley, the mountain sides are steep. 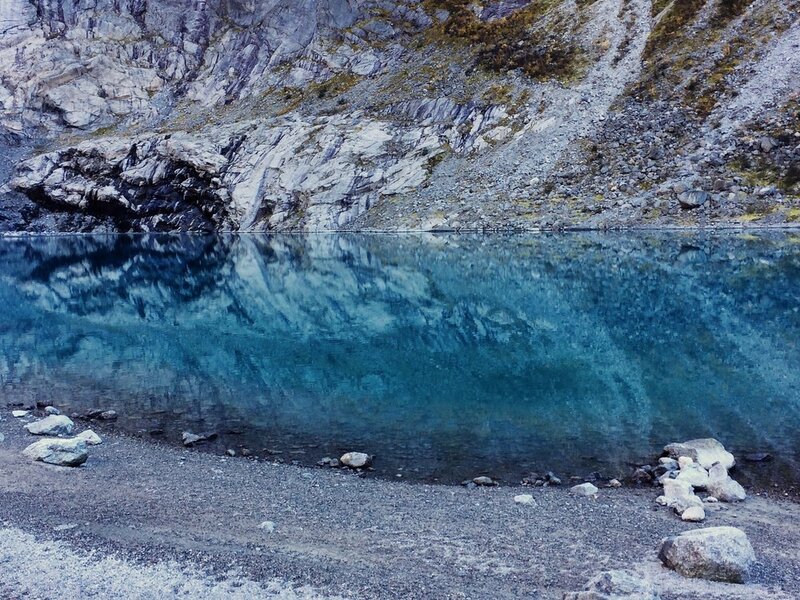 In the valley, you gain a great impression of the glacier, rivers, mountains and waterfalls. It offers a simple hike through a silent, idyllic region, adequate for young and old. 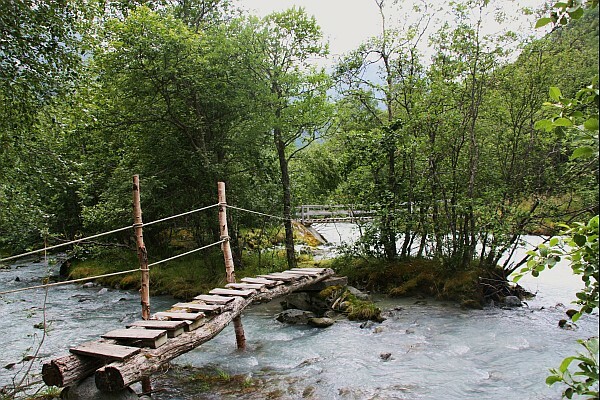 You follow the way to the Briksdal's glacier and turn to the right before the bridge across the waterfall. First, its easy terrain to walk until you reach Sauskårholten. That is a nice viewpoint. People without any experiences in hiking or those who have no head for heights, are advised to reverse at this point. Walking further will lead to a high ridge, yet it is quite easy to walk along. Startpunkt for denne turen er ved Melkevoll Bretun sitt resepsjonsbygg. Herfrå går du vidare forbi dei store hyttene og fylgjer den merka stien. Etterkvert er denne turen bratt, men det er ein god sti som har blitt utbetra med flotte steintrapper av sherpa frå Nepal. Gjennom det meste av turen har ein fin utsikt til Briksdalsbreen. Ein går gjennom fjellsprekka "Gløvret" før ein kjem opp i sjølve dalføret "Oldeskaret" som leier over til Høyset i Stardalen. Kring høgste punkt er der tre mindre og eitt større fjellvatn. Du er no i "skaret" der desse breane er smelta frå kvarandre. For dei som vil vidare til Stardalen, går turen i lett terreng forbi Storevatnet, Haugabreen og Haugastølen (5-6 timar). The recent summers we offered Yoga courses on the top floor of the Melkevoll Bretun's reception. Being surrounded by the whooshing waterfall, a fresh breeze and beautiful nature is perfect to explore and learn yoga. The techniques of Yoga are practical tools to develop good health, to ease the mind and to relax. We do also have several retreats with yoga, healthy food and mountaintrips during the summer season. Read more about our retreats at Maitri Nature Yoga. 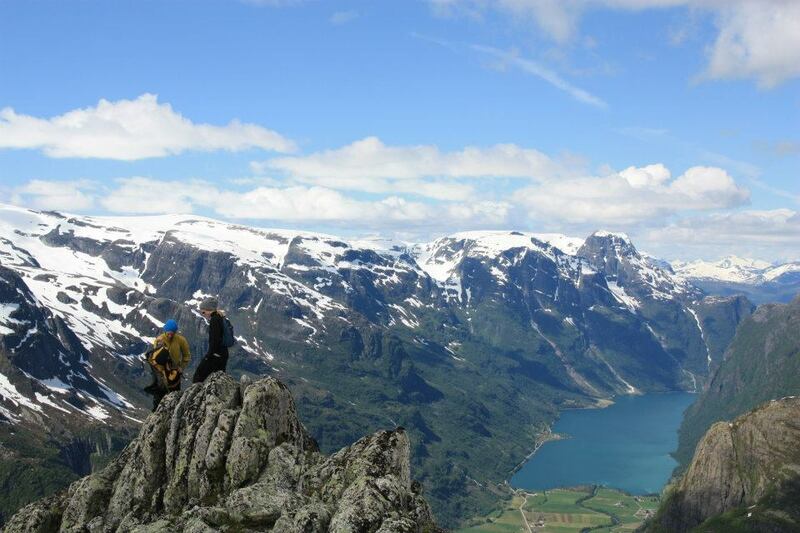 An active milieu for climbing has developed in Indre Nordfjord. Glacier Guides from Olden Aktiv were strongly participating in the development of climbing walls and bouldering in the area. There are many boulders spread around the Melkevoll Bretun campsite, and on of Norway’s most famous sport climbing crags (“Beachen”) is found between Loen and Stryn. The word bouldering comes from the word "boulder" that means large rock. Bouldering is climbing on these rocks. It was the summer of 1997 when Olden Aktiv's glacier guides started climbing on the rocks at Melkevoll Bretun. There are about 60 defined boulder problems on the Melkevoll Bretun today, all marked and annotated with the different levels of difficulty. The rocks are easily accessible and with good landings (level 3a to 8a routs).You can rent crash pad and borrow bouldering guide at the reception. There are many crags for sports climbing in Indre Nordfjord. The Olden Aktiv's glacier guides, and later the members of Stryn Klatreklubb, made the rock face "Beachen" between Loen and Stryn accessible, which is about a 30 min drive from the Melkevoll Bretun. There are routes on "Bølgen" and on "Beachen" with different levels of difficulties from 4+ to 8+/9. So you find routes both for beginners and advanced climbers. Have a look at the climbing guides here. The tour starts at the parking lot of Kvame. It takes about an hour to Kvamsseter, from where you can start ascending up to the leading edge of the glacier, passing Kvamsdalen. There you arrive at the self-service cottage called Flatsteinbu. With the aid of a glacier guide, you easily reach the glacier's plateau, which is comparatively close to the highest glacier elevation Høgste Breakulen. From there you get to the Jostedalen. For the experienced hiker this trip is a must, only half an hour drive from Bretun you can find the starting point to this special mountain on the way to Lodalen. For those interested in spectacular views high up there - «Via ferrata» Loen could be interesting. Read more about this at Loen Active´s page. In May 2017 a new attraction and adventure area opens in Nordfjord. This spectacular pendulum path that has its starting point next to Alexandra Hotel in Loen, 25 minutes drive from Melkevoll Bretun. At the top of the mountain where the cabel car stops is the restaurant and great hiking trails. Read more about Hoven here.